Today's Washington Post published an article about how surging interest in ethanol as an alternative fuel may increase pollutant flows into the Chesapeake Bay. The crux of the article is that demand for ethanol is causing more farmers in the Chesapeake Bay watershed to plant corn instead of other crops. Corn tends to be more fertilizer intensive, so more fertilizer flows off the fields and eventually ends up in the Bay. For me, I think the message that keeps reverberating is that there are no silver bullets. Alternative fuels can play a role in helping us toward sustainability, but we have to pursue all paths: more efficient vehicles, better transit services, more well planned communities, etc. This morning at the end of my bi-weekly commute to Silver Spring, another sweaty cyclist was sitting in front of my building, clearly having just finished his commute, too. We introduced ourselves and he asked where I bike from. I told him Arlington. He raised his eyebrows and said, "Me, too." (He is now the 5th person I have met in the last three months who bike commutes between Arlington and Montgomery County.) We swapped stories. His story was that he decided to try out the commute for Bike to Work Day this last May. That convinced him that it was doable on a daily basis. He went out and bought a bike to meet his commuting needs, and now he's an every day commuter. This was exciting for me to hear. 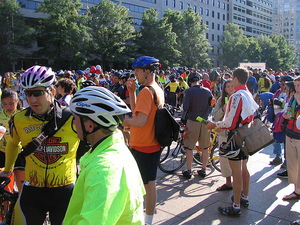 Having participated in BTWD for a long time, I had the sense that everyone was already a bike commuter. It's nice to see--at least for this one commuter--that it was a catalyst for him to become a regular.